Walk into any motorcycle accessory shop and among the vast displays of boots, helmets and clothing you will probably see a wall of gloves. With hundreds of pairs and so much choice, it can quickly get overwhelming. So, to help you decide, we created this buyers guide. Firstly, we take look at what you need to consider when buying a pair of summer gloves. And secondly we review some budget level gloves and give you the lowdown on what to expect from them. In a hurry and just want our top recommendation? Look no further than the Alpine Stars Scheme Kevlar glove. These gloves ooze quality and provide great protection. They also come at a surprisingly reasonable price. 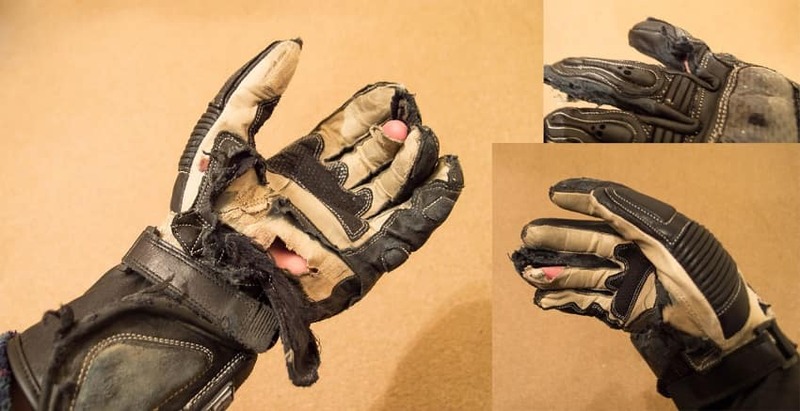 It is important for new riders to realize just how much damage and inconvenience can result from inadequate hand protection. Coming off a motorcycle is likely to make us reach out with our hands and shield ourselves from the worst of the impact. Hands are delicate; a collection of small bones surrounded with skin. Splayed out it takes very little to break or cut them open when sliding across abrasive road surfaces. A well-designed glove will allow you both protection and the ability to operate controls. What use would a glove be if its restrictive padding or armour leads to an accident? Palm padding puts extra distance between the cheese-grating road surface and the soft skin of your palms. An accident might still destroy your gloves but the job of preserving your skin will be done. The addition of palm sliders, often incorporated as tough plastic studs, can turn a potentially abrasive impact into a harmless soft slide leaving no more than minor scratches to the glove. 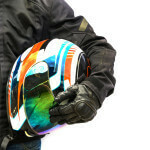 Riders may ask why they would need knuckle protection when the more likely area of impact is the palm and the flat of the hand. 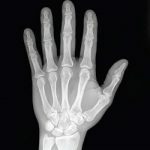 Birds, insects, flying stones and wing mirror collisions can all leave a nasty sting across the knuckles; an area of complex bone structure. With knuckle protection you’re also more likely to come away on the winning side in the event of unexpected road-rage! 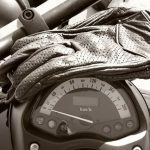 Gauntlets offer more protection around the wrist area than short gloves but some riders may find them hot in the summer months. Short gloves with the additional airflow will give you a cooler ride and are usually cheaper than gauntlets. Summer gloves offer less protection than winter gloves. They are lighter and thinner often lacking the protective accessories of their cold-weather counterparts. Even in the summer we may experience an unexpected downpour or a change in temperature. It is also important that our hands receive a nice steady air-flow to prevent them from sweating and becoming slippery. With throttles and levers to operate the last thing we want is a loss of control. Modern glove designs often incorporate perforations allowing for an air flow around the hands while riding. Quite simply… try them on, but when you do consider a number of factors. Leather gloves are not always waterproof unless aided by additional material but they do stretch over time by around 5%. Man-made textures largely remain fixed, they don’t wear or ‘break in’. Tight-fitting gloves will restrict blood flow and lead to numbness and a possible loss of feel and control. Excessively large gloves may cause your hands to move around and also lose control of the bike. Most gloves come as either ‘gauntlet’ style or short fit. Either way they should both have effective zips or Velcro fasteners to keep them in place. Sizes may differ depending on whether they’re UK, US or European made so make sure you know your true hand size. Fortunately there’s a wide selection of gloves to suit all budgets. Leather is more expensive than textile but generally lasts longer. Higher prices often reflect quality material and stitching and fasteners. The extent and type of built-in protective armour will also affect the price whether its carbon fibre, Kevlar, plastic or cell-foam padding. A good idea when trying on motorcycle gloves is to grab hold of the handlebars of your bike or at least one in the show room. Failing that, just improvise with something like a pole to see how the glove sits in the riding position. I once tried on a pair with so much padding and carbon fibre armour that I could barely grip my handlebars. Make sure that the glove fits comfortably and allows you to handle your bike and perform tasks such as operating the indicator button, horn, brake and clutch control levers. Some gloves incorporate finger-wipes for the visor and also fingers with touch-screen capability. Once you’ve assessed gloves for function, weather and protection then let’s not forget how they look. Most riders love a really stylish pair of new motorcycle gloves especially ones that make them look like a Super Hero (well maybe!). Perhaps you prefer something that matches the rest of your clothing and the bike itself. There’s another advantage to having matching and fashionable gear; if you look more serious and deliberate projecting an image of experience and mastery then perhaps you’ll be inspired to ride that way too. Regardless, like all other selections of motorcycling attire you probably won’t be at a loss for choices in fashion. 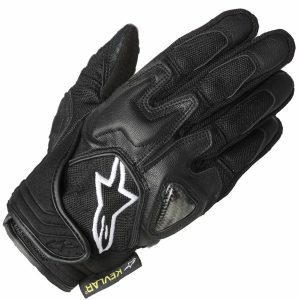 The Scheme Kevlar Glove oozes with the Alpinestar hallmark style and quality. Crammed into this short cuffed glove is an armoury of protection combining Kevlar reinforcement, carbon fibre knuckle defense and padded foam. 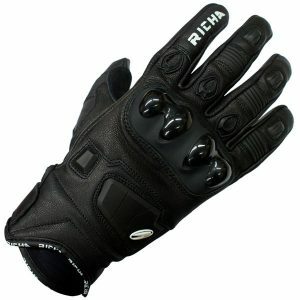 A short cut glove made of very supple leather, these gloves are extremely comfortable with a great fit. You also get a decent amount of armour for the price, with hard armour to the knuckles and protection for the fingers and scaphoid. 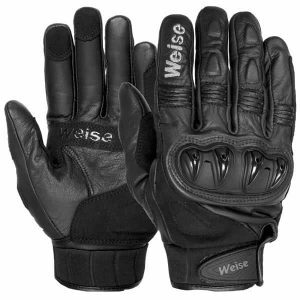 If you’re shopping for a pair of sporty looking summer gloves that give comfort and protection then the Weise Street Fight Motorcycle Gloves are a good buy. These short cuffed gloves are equipped with many features including ventilated PU knuckle armour and tough durable leather perforated around the fingers allowing your hands to breathe during hot weather. These black, sporty and stylish looking gloves are technically a short cuffed glove but their base extends further than most designs affording a little extra coverage around the wrists. These are the cheapest gloves on our list and as such won’t offer a massive amount of protection in a spill. The quality is distinctly average and these gloves should be considered a temporary solution if funds are low. If I was only buying a pair of gloves to keep my hands warm while commuting to work on trains and buses then I would be happy saving a few pounds on a cheaper pair. Tripping over in the high street or falling down an escalator in the rush hour is unlikely to destroy your hands. 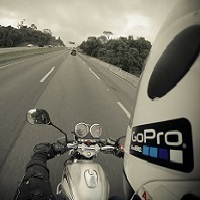 Coming of a bike at speed with inadequate protection… will. Given the enormous cost and inconvenience of a serious hand injury I would go straight to the top and choose the Alpinestar for its high-quality protection properties. Instead of comparing the price to other gloves, compare it to other items of protection like helmets and jackets or even parts of your bike. So, wear not just your new gloves but two caps when buying them; one for choosing functionality and style and the other for evaluating the glove’s protective characteristics.